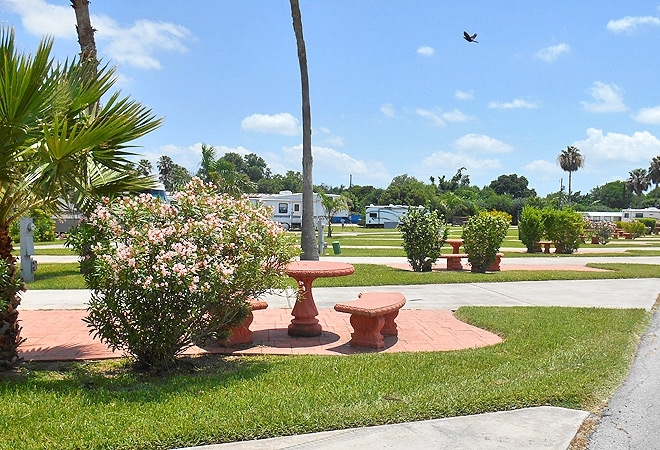 Activities abound at Fun-N-Sun RV Resort, located in the Rio Grande Valley. Expect to keep busy at this campground, where a variety of activities will have you up from dawn ‘til dusk! Not only does Fun-N-Sun boast one of the largest dance floors in Texas, it also offers guests bingo, arts & crafts, live entertainment, and movies as well as other popular activities. Whether you prefer a fun-filled calendar of events or enjoy simply relaxing, our Rio Grande Valley RV resort is the place to be! Located just 45 minutes from beautiful South Padre Island, Fun-N-Sun RV Resort guests can find relaxing beaches as well as enjoy exploring other nearby off-site attractions. Stay for a week, month or even longer!